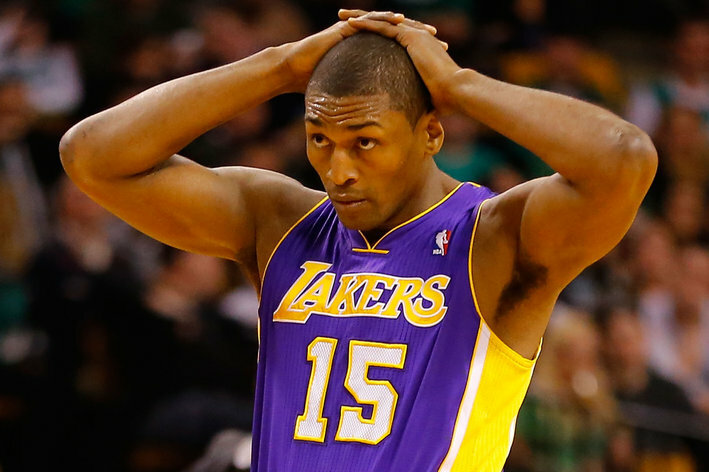 The Los Angeles Lakers’ may be in some trouble getting to the play offs even more with Metta World Peace receiving an MRI exam in Minneapolis that showed a cartilage tear in the lateral meniscus of his left knee. He will return to Los Angeles, where he will be examined Today by the team’s doctor Steve Lombardo, forcing him to miss tonight’s game against the Timberwolves. An update, including a timetable for his return, will be issued at the conclusion of his examination, according to the team. In another tweet, World Peace wrote: “I can’t wait to get back. But our team is so good We will win and get into the playoffs.” …hmmm glad he has some hope and confidence in his team! World Peace had been the only member of the Lakers’ season-opening starting lineup yet to miss a game because of injury this season. World Peace has played in 70 of L.A.’s 71 games (sitting one due to suspension) and averaged 12.8 points, 5.1 rebounds, 1.5 assists and 1.7 steals per game. We at StilettosNhiphop him a speedy recovery!